Marvel Now! shows you the future, and it's fantastic! 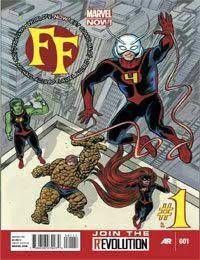 In the Fantastic Four's absence, a hand-picked substitute squad—Ant-Man, Medusa, She-Hulk and Miss Thing—must guard Earth and the fledgling Future Foundation for four minutes. What could go wrong?